The opportunity to perform in a ‘live’ setting, in front of a paying audience is considered key to the development of the aspiring musician. Pianist Tom Bearpark is the young man in this Tyneside vanguard and who knows, one day Tom and his student friends could be performing at the Village Vanguard, NYC. Course tutors kept out of the way, the gig is a student-run gig. 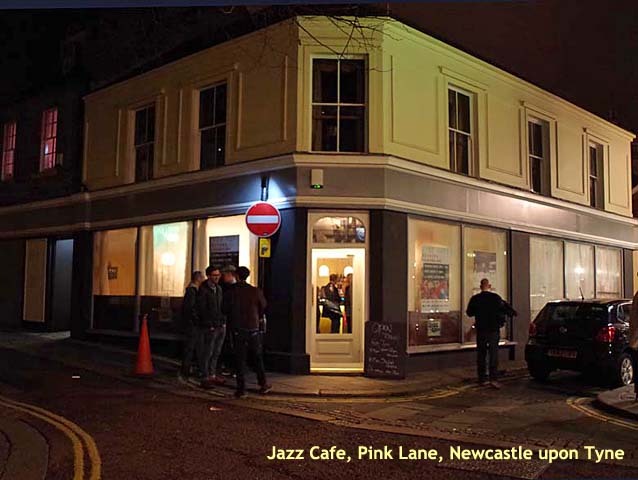 Bearpark imposed a three line whip thus ensuring fellow students turned out in force, making for a supportive environment and bar sales turned over (this is a jazz gig imperative), no doubt making the Jazz Café’s manager a happy bunny on the night! Tom Bearpark leads the band, Thomas Dixon fronts the band. Bearpark cuts a shy figure, Dixon likewise, but someone has to do the talking so it fell to the amiable Dixon, playing alto and tenor on this gig, to say ‘hello’ and introduce the tunes. The quartet played many familiar numbers and, growing in confidence, launched into a freer piece culminating in a coruscating tenor workout…the sound of things to come! Several students sat in – female vocalists to the fore – and the Bearpark Quartet with the excellent Stephen Wall, bass and drummer Adam Watson completing the line-up went out on a high with Wonderful World (it was wonderful, featuring Wall’s into) and, right up Bearpark’s street, a rousing take on Horace Silver’s Song for my Father. BABMUS has made an encouraging start with audience numbers exceeding expectations. The session isn’t a free admission gig – it’s a real world, commercial proposition. Give it a try, show your support, a BABMUS gig is well worth catching.